This review is about item#42217621. As an anchor bolt as an iron plate clamping nut. 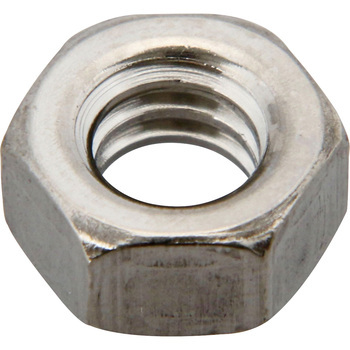 Although it used also double nut as a rotation when attaching an anchor bolt, it was able to smoothly be removed without bite. This review is about item#42217637. Especially, there was no problem, and it was done. To say luxury, I wish it was a bit cheaper, Will this size be low demand? This review is about item#42217524. Even if I looked for a lost nut at the home center, I could only stop M2.6. I tried using it and I was satisfied with just size. This review is about item#42217542. It is very useful because it is strong in stainless steel. Quality is also good. This review is about item#42217594. It is better to save time than going to the home center and purchasing it. If it can be used for automobiles, if the diagonal dimension is 12 mm Since it is enough to change the wrench less, the diagonal dimension is 12 mm I also appreciate it if you can also offer items of. This review is about item#42217612. I wanted a carbon steel nut, but it may be good because it is stainless steel and it does not rust. It is necessary to build a tool of fishing skill and it is saved because there are not many small bolts, nuts, etc. at home centers so it is a consumable item so I would like to buy it as soon as I lose it. It was very helpful to find an affordable screw. This review is about item#42217585. Since buying at DIY 1.5 times or more, it is satisfactory in terms of price and minimum purchase unit is also set to be small, so do not waste it. This review is about item#42217576. It was easy to purchase and it was saved because I was in a hurry. It is very savable because it is not easy to find. This review is about item#42217603. There are various sizes and it is appreciated. There is nothing to mention about the product, but in stores such as home centers, even if you are handling screws and nuts of M 2.6 mm, there is no handling shop for M 2.5 mm nut, it will be saved. I bought it because a 7 mm nut is used for my motorcycle. It is like a nut with a 7 mm tap on a 6 mm nut. I bought it to install a micro coupler socket. Because it is stainless steel, it is good not to rust. Because the price is cheap, it is possible to purchase without resistance and I am very satisfied. Although M7 nut was hard to find and was struggling, it was saved because we could purchase it here.